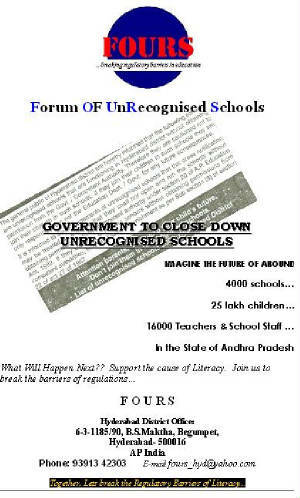 As you are all aware of the fact that the High Court of Andhra Pradesh has passed an order to close down all unrecognized schools with immediate effect, we felt it is high time we get united to voice our opinions, highlight our issues and appeal for an amicable solution to this impending disturbance which has severely affected the functioning of our schools. The confidence and enthusism of the managements of all unrecognised schools have been badly shaken and this issue also puts at stake the careers of thousands of innocent children. We feel we must unitedly oppose this and come together under a single banner and espouse the cause of education to the underprivileged children and the society in particular. Please browse through this site and give us your comments, opinions, criticisms, if any ,so that we might take on the giants of regulations and all opposing forces of education and literacy.